These flue stretchers are raising flues to a whole new level! Negative house pressures can pull the smoke from one flue down another flue right beside it. Adding the Flue Stretcher to the upstairs flue distances its smoke from the downward pull of the downstairs flue. By putting the flue opening above roofs and other nearby structures, you will improve draft and reduce downdrafts. Flue Stretchers are available in both Copper and Stainless Steel. They are available in a variety of shapes and sizes. The one foot size is 22" in overall height, and adds one foot to the flue height. 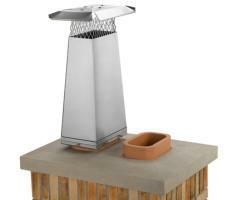 The Two Foot size is 34" in overall height, and adds two feet to the flue height. The Flue Stretcher easily tightens with screws tot he flue tile on all four sides of the base for extra security. Load tests simulating side wind and updraft conditions have demonstrated the flue strecher mounting system holds tight under several hundred pounds of force.